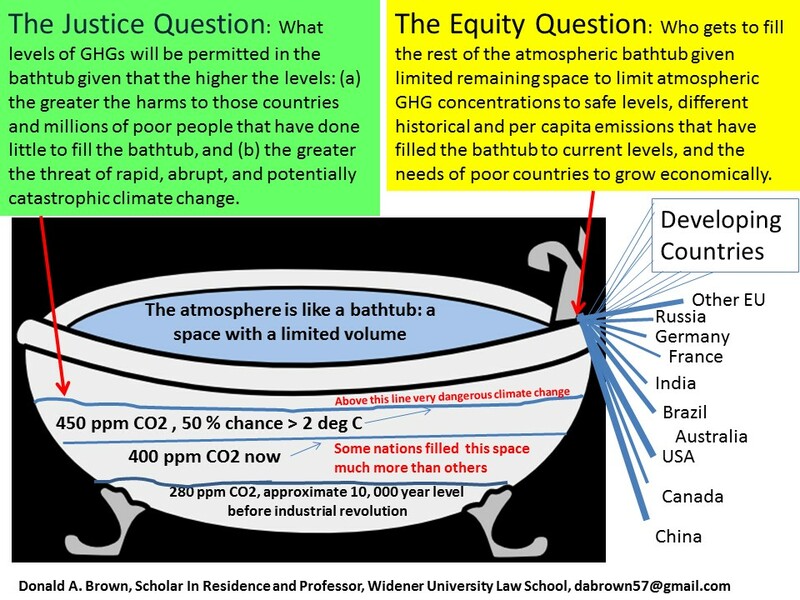 A Picture To Help Citizens Understand the Justice and Equity Issues That Must Be Faced in Setting National GHG Emissions Targets. All nations, when they set national ghg emissions reductions targets, are implicitly taking a position on the following two civilization challenging ethical issues. The international community should require that all nations explicitly explain their positions on these two issues. Every national ghg emissions reduction target is implicitly a position on the two above civilization challenging ethical issues, although nations almost never identify the positions they have taken on these issues nor acknowledge that these are ethical matters. These issues are: (1) a ghg atmospheric concentration stabilization goal, and (2) the nation’s fair share of global ghg emissions that will achieve the atmospheric goal. This picture seeks to help citizens understand these issues. Both of these issues are essentially ethical and moral issues. This is so because in taking a position on an ghg atmospheric stabilization goal, a nation is determining how much harm it is willing to inflict on hundreds of millions of poor vulnerable people around the world and the ecological systems on which life depends. Also, in specifying a ghg emissions reduction amount, the nation is also taking a position on what distributive justice requires of it to reduce global ghg emissions to safe levels. Governments should be required to explain their positions on these issues because every national ghg emissions reduction target is implicitly a position on these ethical questions.